Another trip is planned for our little crew and this week we are headed to see family. We are all excited to meet our newest nephew and have some cousin playtime! In addition, this week had to be easy & quick meals since we have packers coming to load up our house-hold goods. A fun and action packed week, it will surely be one to remember. 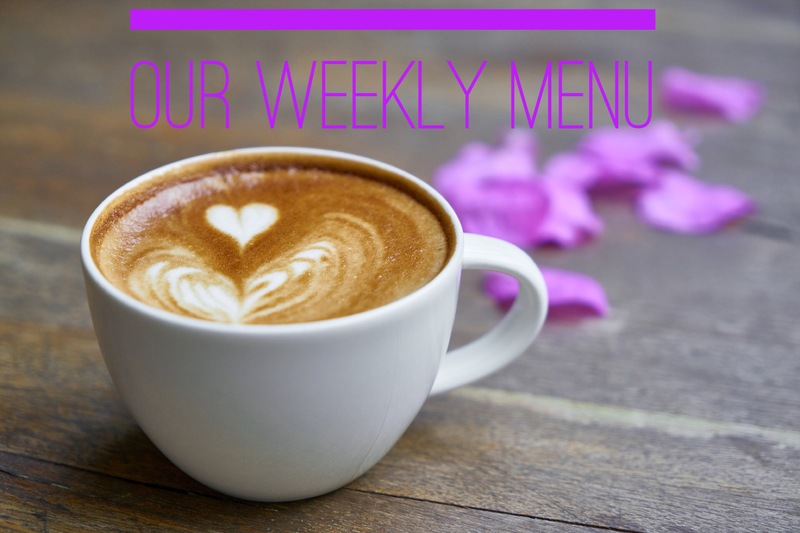 Needed a couple recipes to add to your weekly men, see our choices and a few recipes below. For our full menu, click on this link. Click here to learn more about the Trim Healthy Plan. Combine all above ingredients and toss to coat blueberries. Place into a prepared pie crust, cover and bake at 375 degree for 35 minutes. Uncover bake for an additional 10 minutes. For a pie crust, consider using a low carb option from Trim Healthy Mama. 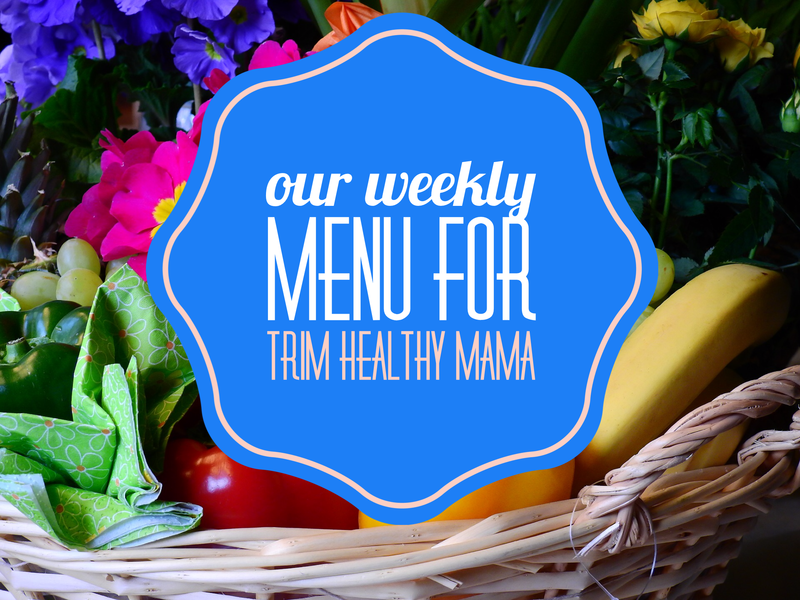 Our Trim Healthy Mama Lifestyle Menu is ready for the last week in April. Quite a few of the recipes use my favorite cooking tool, the Instapot. Not only does it speed up the time of dinner and desserts but I use a lot less pans/pots making cleanup a breeze. New to Trim Healthy Mama? Consider exploring the website , check out the Trim Healthy Mama book or order the helpful Cookbook! Monday: Roasted Fish with Sweet Potatoes Fries in the Air Fryer . (E) To adapt to an E for Trim Healthy Mama, only light spray the sweet potatoes with coconut oil or omit this step. Our fries turn out nicely without the extra oil. Tuesday: Chicken Pot Pie Page 137 In the Trim Healthy Mama Cookbook (S). A family favorite, this hearty meal is worth the time. We are going to try and adapt in the Instapot for a shorter cooking time. Wednesday :Smothered Burritos with Low Carb Tortillas(S) from Pressure Cooking Today . This is a quick, easy and delicious recipe. Thursday: Hot Dogs with THM Crescent RollsLow Carb Sausage and Cream Cheese Crescents from My Fling with Food (S). We are going to use the crescent rolls from this blog and wrap around our Hebrew National Hot Dogs! Friday: Family Pizza Night (C/O) Check out this yummy recipe from Gwens-Nest for a pizza crust idea. Saturday: Whole Roasted Chicken (S) from Cooking with Curls . Last time we created this recipe, the chicken melted off the bone and tasted just like a rotisserie chicken. Sunday: Bean Tacos (E) Our middle daughter’s birthday choice is simple and easy tacos. To make this an E, I use beans, quinoa, a bit a mozzarella cheese and low carb tortillas. For extra fun flavor consider adding strawberries and Feta Cheese. This past week family visited and we didn’t fully stick with our menu. With that in mind, many of my recipes rolled over to this week’s menu. So, for tonight we enjoyed last week’s menu item, Mexican Quinoa Tacos. I ended up cooking them in the instapot for 10 minutes, which sped up the dinner process considerably. We also added ground turkey flavored with the extra red enchilada sauce (I purchased a 28oz and the recipe called for 14oz). 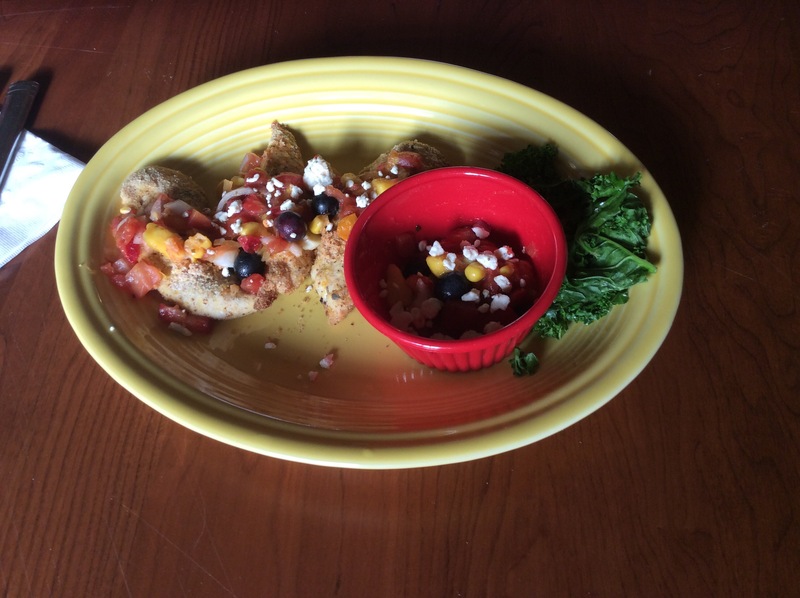 It was a delicious energizing meal that everyone enjoyed. For more information about energizing meals and the plan I follow, Trim Healthy Mama, click here. Yesterday we traveled to our local strawberry farm were we picked delicious red ripened strawberries. 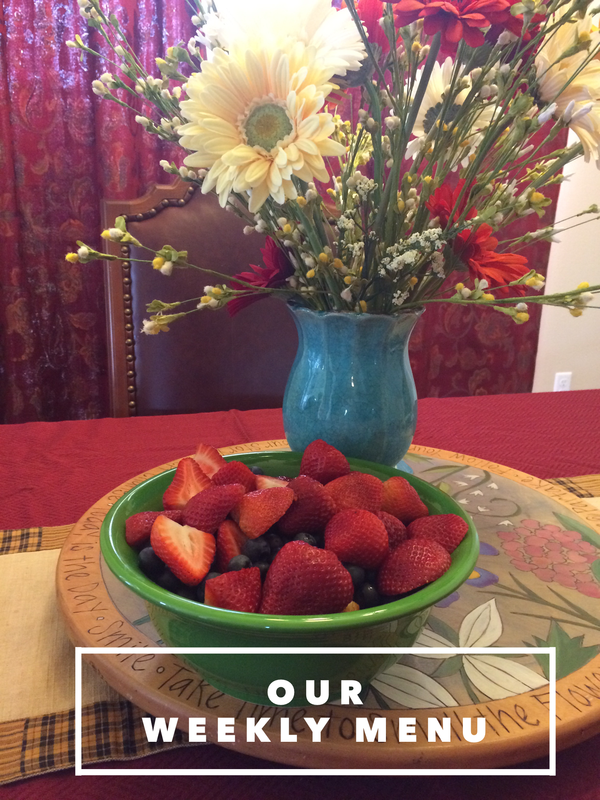 With a surplus of juicy berries, I created a few new recipes so delicious I added them again this week. This morning we made strawberry pancakes (See the recipe below) and Strawberry Syrup (also posted below). They were all gobbled up before I thought to snap a picture. I’ll make sure to post a picture later this week, when we recreate. Finally, this evening we made strawberry salsa that was also delicious! 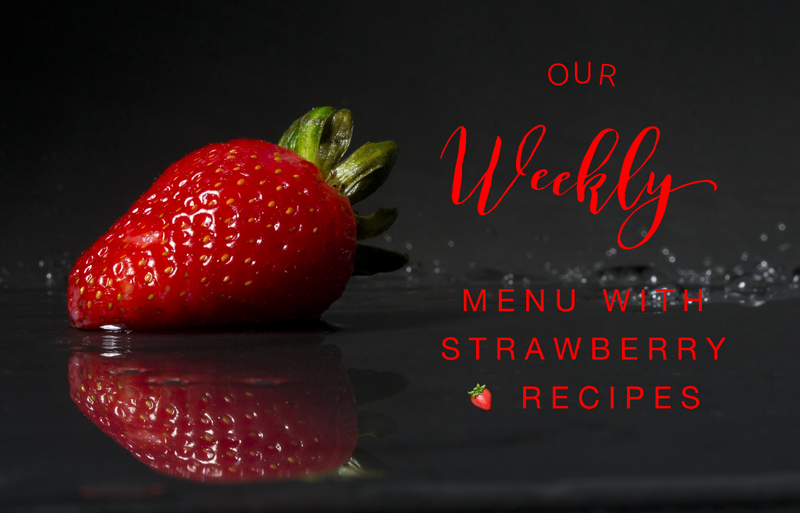 Hopefully more strawberry recipes and meals are to come! For now, here is this week’s line up. For our full menu, click here.